In general, doctors recommend that men with an average risk of prostate cancer make choices that benefit their overall health. 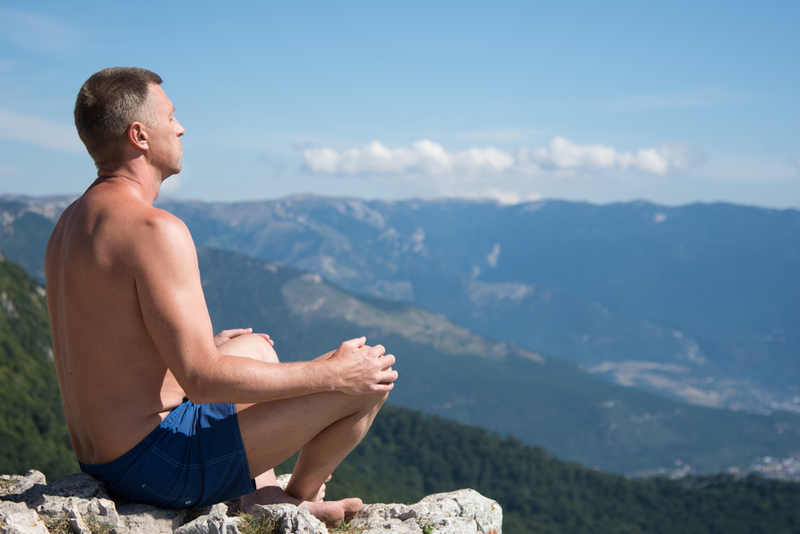 Below are some things that have shown some evidence of lowering your prostate cancer risk. Exercise can help you maintain your weight, or it can help you lose weight. Men who exercise may have a reduced risk of prostate cancer. Exercise has many other health benefits and may reduce your risk of heart disease and other cancers. If you are overweight or obese, work on losing weight. You can do this by reducing the number of calories you eat each day and increasing the amount of exercise you do. If you have a healthy weight, work to maintain it by exercising most days of the week and choosing a healthy diet that's rich in fruits, vegetables and whole grains. See the section below for some great recipes and exercise tips! If you don't already exercise, make an appointment with your doctor to make sure it's OK for you to get started. When you begin exercising, go slowly. Aim for 30 minutes of exercise most days of the week. Try to keep the amount of fat you eat from red meat and dairy products to a minimum. In some studies, men who ate the highest amount of fat each day had an increased risk of prostate cancer. While this association doesn't prove that excess fat causes prostate cancer, reducing the amount of fat you eat each day has other proven benefits, such as helping you control your weight and helping your heart. To reduce the amount of fat you eat each day, limit fatty foods or choose low-fat varieties. For instance, reduce the amount of fat you add to foods when cooking, select leaner cuts of meat, and choose low-fat or reduced-fat dairy products. In studies, men who ate the most dairy products — such as milk, cheese and yogurt — each day had the highest risk of prostate cancer. But study results have been mixed, and the risk associated with dairy products is thought to be small. Eat more fish. Evidence from several studies suggest that fish can help protect against prostate cancer because they have "good fat", particularly omega-3 fatty acids. Avoid trans fatty acids (found in margarine). Try to incorporate tomatoes that are cooked with olive oil, which has also been shown to be beneficial, along with cruciferous vegetables (like broccoli and cauliflower) into many of your weekly meals. Eat more fat from plants than from animals. In studies that looked at fat consumption and prostate cancer risk, fats from animals were most likely to be associated with an increased risk of prostate cancer. Animal products that contain fats include meat, lard and butter. You might consider using plant-based fats instead of animal fats. For instance, cook with olive oil rather than butter. Sprinkle nuts or seeds on your salad rather than cheese. Soy and green tea are also potential dietary components that may be helpful. Pomegranate juice and legumes are also encouraged. What about supplements? Avoid over-supplementation with megavitamins. Too many vitamins, especially folate, may "fuel the cancer", and while a multivitamin is not likely to be harmful, if you follow a healthy diet with lots of fruits, vegetables, whole grains, fish, and healthy oils you likely do not need a multivitamin. Watch your calcium intake. Do not take supplemental doses far above the recommended daily allowance. Some calcium is fine but avoid taking more than 1,500 mg of calcium a day. Always check with your healthcare team before taking anything on your own. Avoid smoking for many reasons. Most studies have not found a link between smoking and getting prostate cancer, but quitting smoking can help you maintain a healthier lifestyle. Alcohol should be consumed in moderation, if at all. Seek medical treatment for stress, high blood pressure, high cholesterol, and depression. Treating these conditions may save your life and will improve your survivorship with prostate cancer. A yearly rectal examination and PSA test will also go a long way in early detection or diagnosis. will improve your survivorship and lead to a longer, happier life. According to the Centers for Disease Control and Prevention (CDC), the number one cause of death in men of all ages was cardiovascular disease (CVD). Killing 321,000 men in 2013 — that’s 1 in every 4 male deaths. That means preventing CVD is an important thing you can do for your health; regardless of whether you have prostate cancer. Fortunately, you can do something to improve your heart health—start by increasing regular exercise, eating right and checking your cholesterol and blood pressure. In fact, knowing your cholesterol and blood pressure numbers is just as important as knowing your latest PSA results. With your doctor’s advice, making simple changes to your eating habits and exercise regimen can help make a difference in your overall heart health. Cholesterol numbers can help predict your risk of heart disease. They can also let you know if lifestyle changes, such as changes in your diet and starting an exercise program should be considered. Talk to your doctor about what your cholesterol numbers mean. You can also learn more about taking care of your heart from the American Heart Association. 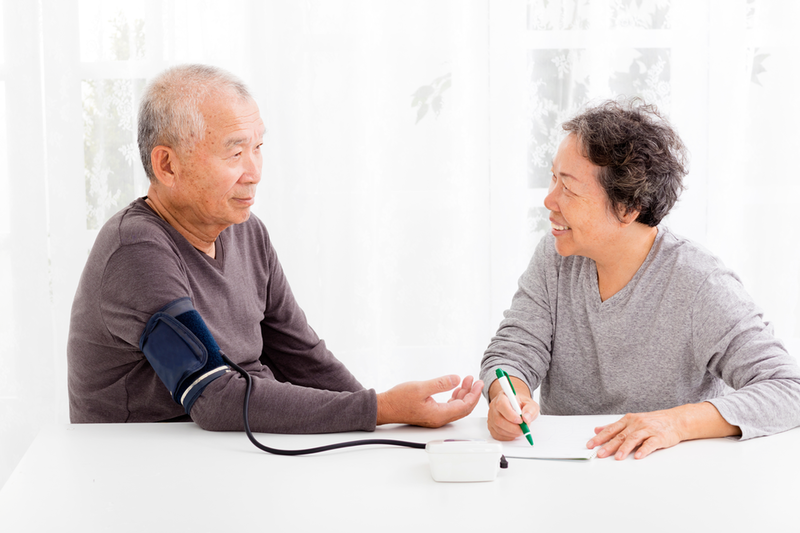 Have your blood pressure levels monitored regularly to ensure good heart health. Blood pressure levels can let you know how well your changes in lifestyle are working. Optimal blood pressure levels may also lower the risk for some abnormal prostate conditions. Definitions to Understand: Systolic is the measurement of blood pressure when your heart contracts. Diastolic is the measurement of blood pressure when your heart relaxes and expands. Besides making healthy choices in your diet, men being treated for prostate cancer should start an exercise routine. Resistance exercise can help reduce symptoms of fatigue related to prostate cancer treatment. Exercise also strengthens muscles that may have become weakened with hormone treatments. Before starting any exercise program, always talk with your doctor to ensure that your program is safe for your physical condition. There are many reasons why we tend to slow down and become more sedentary with age. It may be due to health problems, weight or pain issues, or perhaps you think that exercising simply isn’t for you. But as you grow older, an active lifestyle becomes more important than ever for your wellbeing. Exercise can help boost your energy, maintain your independence, protect your heart, and manage symptoms of illness or pain as well as your weight. Daily exercise is also good for your mind, mood, and memory. Becoming active is not just about adding years to your life, but about adding life to your years. You’ll not only look better when you exercise, you’ll feel sharper, more energetic, and experience a greater sense of wellbeing. The International Prostate Cancer Foundation has developed a great tool for assessing your baseline health. You may want to print the results and share them with your doctor. Together, you’ll be able to discuss the next steps you should take toward a healthier lifestyle. This baseline will also help you know when you are making improvements! To take the quiz, click here. Exercising for as little as 30 minutes a day can help improve your health. You may even be able to reduce some of the side effects related to prostate cancer treatments by being physically active. Tip: Exercising with friends is both social and motivating. You should exercise enough to achieve or maintain a healthy weight. A good way to get started is to find exercises or activities that you enjoy, such as: yoga, powerwalking, swimming, riding a bicycle, dancing, gardening, etc. The important thing is to stay active and keep moving, without overdoing it. A good rule is to exercise enough so you breathe hard but are still able to carry on a conversation. Nutrition is an important part of cancer treatment. From changes in taste, to appetite lose and overall fatigue, you may face several challenges. This is common for people living with cancer. Balancing your diet can be a challenge at the best of times, but when going through a cancer journey it is even more important. 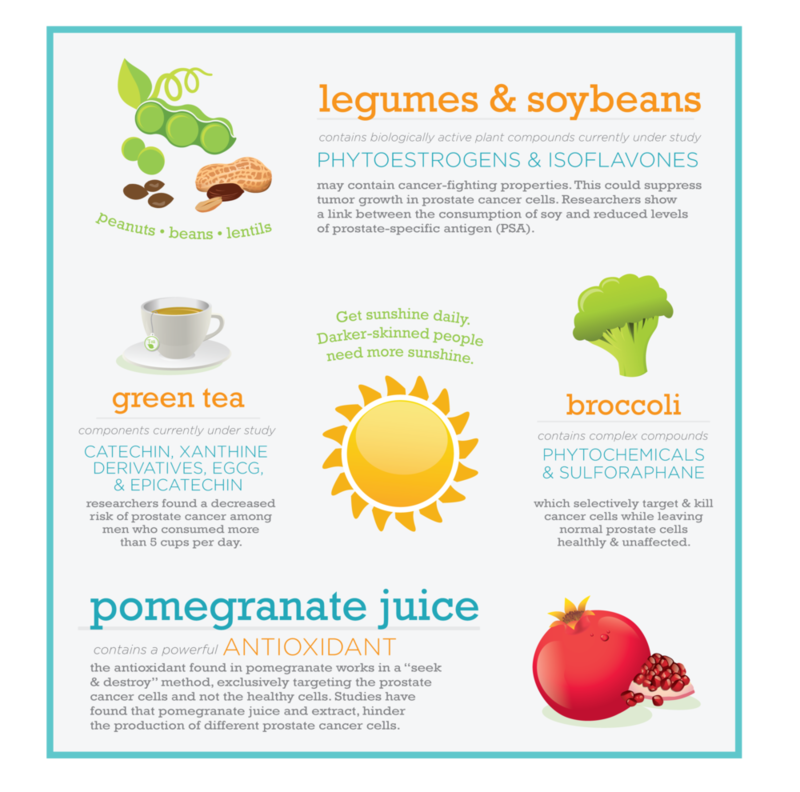 The right balance of proteins and calories can help your body stay strong and healthy — before, during, and after cancer treatment. Eating in a healthful manner may help to keep your strength up through a treatment course, provide more energy to spend time with family and friends or be productive at work. It may be important to consider working with a registered dietitian to help with specific nutritional needs. It's important to talk with your doctor before embarking on any major changes to your diet, including taking any vitamins or supplements on your own. Some vitamins and supplements can affect your prostate cancer treatment. When you eat healthy food and exercise, your whole body is affected in a positive way. A healthier lifestyle means making smart choices whenever possible. Below are some things to keep in mind regarding your nutrition. Watch your portion sizes: Do not overeat. Eat smaller portions of food. Choose the most nutritionally rich foods you can from each food group each day — low calorie foods packed with vitamins, minerals, fiber and other essential nutrient. Eating fiber-rich foods — for example: beans, fruits, vegetables, bran cereals, flaxseed, whole grains, and oats — can help many areas of your body, such as heart, prostate, and digestive health. There are several benefits to adding fiber to your diet, including helping to make you feel full, which can help control your weight. It can lower cholesterol, improve your blood sugar balance, make bowel movements easier and can reduce the risk of digestive problems. How much fiber should you have? If you are a man older than 50 years, 30 grams a day should be your goal. Flaxseed is high in fiber, omega-3 fatty acids, and phytochemicals called lignans. Flaxseed (and its oil) is used as a laxative, to help improve digestive health, relieve constipation, and reduce the risk of heart disease. The addition of soy protein to a diet low in saturated fat and cholesterol may help to reduce the risk of heart disease. Omega Fatty Acids are thought to be good for your overall health and may be good for your prostate health as well. Increase cold water fish, flaxseed, walnuts, soybeans and canola oil. Bake or broil fish, and avoid eating fried fish as the trans fats in fried foods are unhealthy. 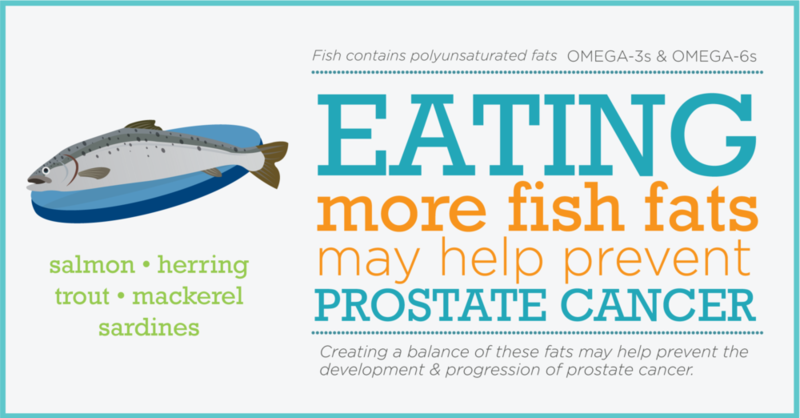 Some studies have shown eating fish 3 times a week lowers your risk of prostate cancer. 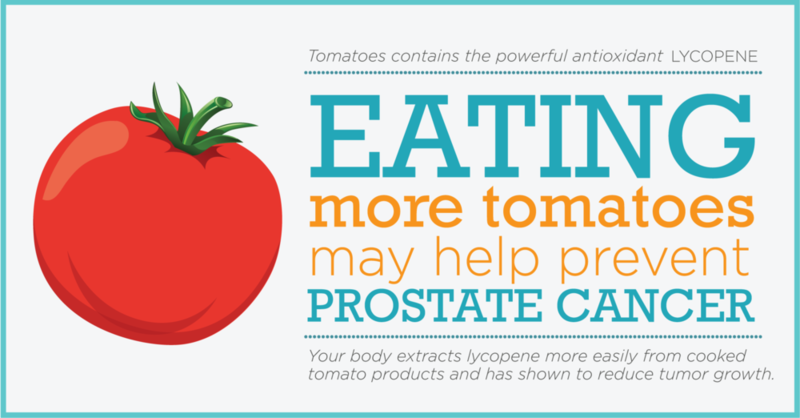 Here's a guide to get you started to a healthier prostate. Be sure to substitute unhealthy foods with foods that are nutritious and beneficial whenever possible. Avoid fried foods. Eat broiled or baked fish, a few servings each week. Opt for steamed, grilled, or broiled dishes at restaurants. Fruits, vegetables, whole grains, and fat-free or low-fat milk and milk products are all smart choices. Choose the most nutritionally rich foods you can from each food group each day — foods packed with vitamins, minerals, fiber, and other essential nutrients that are lower in calories. Increase your daily fiber intake (a 50-year-old man should have 30 grams of fiber each day) through a variety of food sources. Drink plenty of water when you increase your fiber intake. Look for healthy sources of protein and fat — such as fish, lean meats, nuts, and seeds. Don’t try to cut out fat altogether because your body needs these nutrients and cutting out good fats can decrease good cholesterol. Read nutrition labels. Count your calories; also, consider how much fat, protein, and carbohydrates the foods you eat contain. Watch your serving sizes — eat smaller portions of food. At restaurants, if you order a full-size entree, box up half of it before you start eating.